In recent years, citizen science has emerged as a powerful new concept to enable the general public, students, and volunteers to become involved in scientific research. A prime example is in biodiversity conservation, where data collection and monitoring can be greatly enhanced through citizen participation. This is the first book to provide much needed guidance and case studies from marine and coastal conservation. The novelty and rapid expansion of the field has created a demand for the discussion of key issues and the development of best practices. 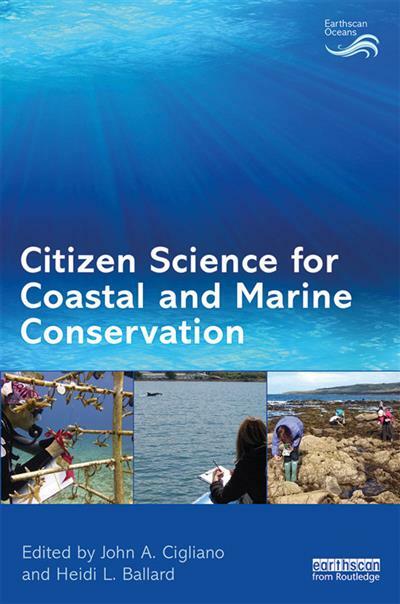 The book demonstrates the utility and feasibility, as well as limitations, of using marine and coastal citizen science for conservation, and by providing critical considerations (i.e.which questions and systems are best suited for citizen science), presents recommendations for best practices for successful marine and coastal citizen science projects. A range of case studies, for example, on monitoring of seabird populations, invasive species, plastics pollution, and the impacts of climate change, from different parts of the world, is included. Also included are discussions on engaging youth, indigenous communities, and divers and snorkelers as citizen scientists, as well as best practices on communication within citizen science, building trust with stakeholders, and informing marine policy as part of this exciting and empowering way of improving marine and coastal conservation. John A. Cigliano is Professor of Biology and Director of Environmental Conservation in the Department of Biological Sciences, Cedar Crest College, Allentown, Pennsylvania, USA; adjunct faculty at the Schoodic Institute at Acadia National Park, Winter Harbor, Maine, USA; and an Earthwatch Institute Principal Investigator. He collaborates with citizen scientists to study the effects of ocean acidification and warming on temperate rocky-intertidal organisms and communities. John is currently the Past President of the Marine Section, the Vice President of the Participatory and Citizen Science Working Group, both of the Society for Conservation Biology, and a founding member of the Citizen Science Association. Heidi L. Ballard is Associate Professor of Environmental Science Education and Faculty Director of the Center for Community and Citizen Science at the University of California, Davis, USA. She leads research on what and how adults and youth learn about science, the environment, and their communities through participation in citizen science and community science. She is on the Editorial Board of Citizen Science: Theory and Practice, and a member of several professional societies' working groups focused on citizen science. She has collaborated with numerous citizen and community science projects internationally to help improve design and evaluation of their programs.